No official rules exist for having the perfect wedding. 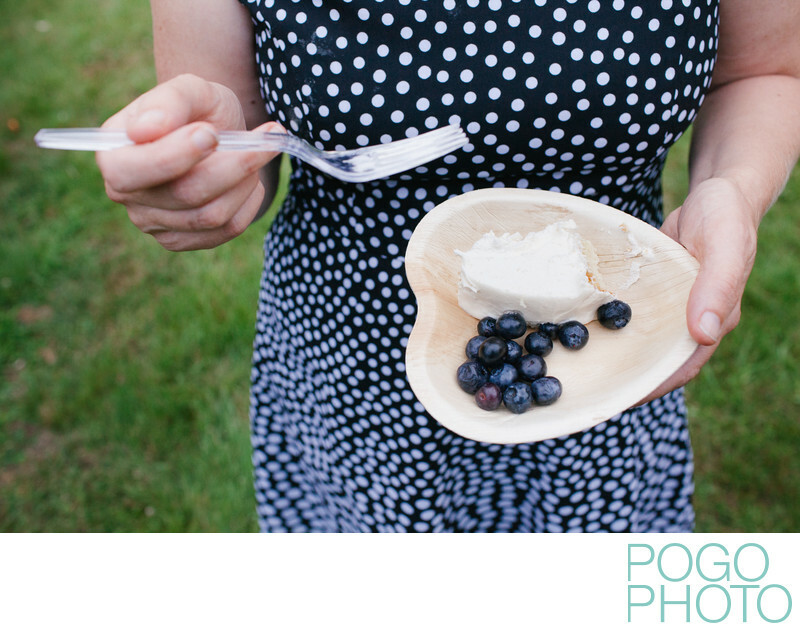 Perfect can be paper plates and plastic forks, a buffet set up on sawhorses and plywood planks, and a simple frosted vanilla cake with farm fresh blueberries. This backyard wedding in New Hampshire was the ideal combination of good food, a relaxed environment, and a group of guests looking to have a good time, proving yet again that a party is what you want it to be: you'll get married regardless of whether your guests use china and silver. Casual weddings in rural Vermont and New Hampshire have the added benefit of abundantly available local food (everything from organic produce to small batch cheeses and ciders, local maple syrup, jams and jellies, fresh bakery goodies, the list goes on and on) and incredible chefs and caterers, making a casual celebration just as delicious as any elegant sit down banquet. This small and low key wedding took place in Cornish, New Hampshire, at Trinity Church and in the churchyard outside afterward. Trinity Church is somewhat famous in the region for having been owned by the notorious conman and subsequently convicted murder Clark Rockefeller, though it is now property of the town of Cornish, returning to its quiet small-town roots and is much today as it was when it was built in the very early 1800's. Location: Trinity Church, Cornish, New Hampshire. 1/250; f/5.0; ISO 1600; 35.0 mm.